I took Doc’s Strobe Lab class in the fall of 1973. Even then, Doc was looking for new uses for his strobe light and his other innovations. At that time, the FAA had not yet approved strobe lights as an alternative aircraft warning light for buildings and broadcast towers. 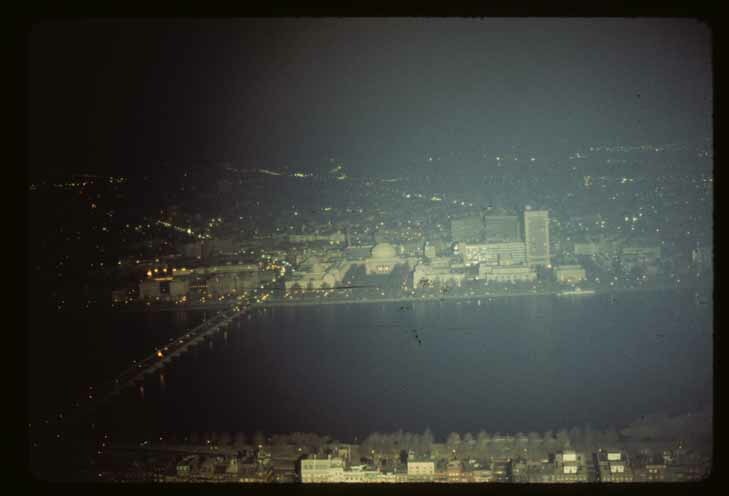 As a pilot test, one strobe was installed atop the Prudential Tower in Boston. That strobe was powerful. I recall flying into town on a foggy night and, when literally no building (and no red warning light) was visible; I watched the flash illuminate the interior of a cubic mile of cotton. Strobes sometimes fail. That one did while I was taking the course. The lab manager was sent to fix the thing. I volunteered to tag along. Onto the very roof of the Pru. The roof in those days was a pebble surface and had no guardrail. Fortunately the strobe was in the middle of the roof. Every strobe is a tube containing a noble gas. This tube was six feet long, nestled in a V-shaped reflector. We found a gallon sized capacitor that had failed, and replaced it. The strobe power supply used several of those capacitors. On the roof at the same time was a broadcast engineering team, possibly from WCVB. The restored strobe immediately made their work almost intolerable, even in daylight, even though the reflector aimed most of the periodic lightning skyward. Doc definitely conveyed to all his students of that era the idea that engineering could be fun as well as challenging. That unique field trip was an example. This entry was posted on Tuesday, February 14th, 2012 at 7:51 pm and is filed under Personal stories. You can follow any responses to this entry through the RSS 2.0 feed. Both comments and pings are currently closed. Tell a story about Doc! Did you know Doc Edgerton? What do you most remember, and how has it affected your life? Help this project document Doc's life and impact by sharing your experience.